WASHINGTON, D.C. -- Less than one-third (31.5%) of U.S. workers were engaged in their jobs in 2014. The average is up nearly two percentage points from 29.6% in 2013 and represents the highest reading since 2000, when Gallup first began tracking the engagement levels of the U.S. working population. However, a majority of employees, 51%, were still "not engaged" and 17.5% were "actively disengaged" in 2014. Gallup defines engaged employees as those who are involved in, enthusiastic about and committed to their work and workplace. The 2014 employee engagement average is based on Gallup Daily tracking interviews conducted from January to December 2014 with 80,837 adults employed for an employer. 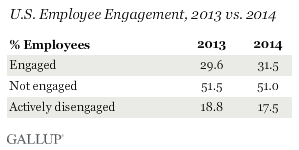 The 1.9% increase in engagement from 2013 to 2014 represents 2.5 million employees nationwide. Gallup categorizes workers as engaged based on their responses to key workplace elements it has found to predict important organizational performance outcomes. 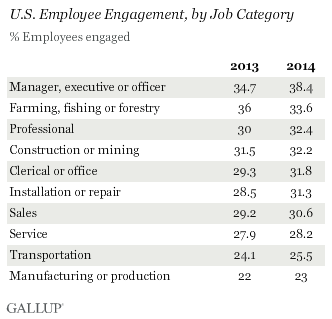 Among job categories, managers, executives and officers had the highest levels of engagement in 2014 at 38.4%. This group outpaced every other job category Gallup tracked and saw the greatest gains in engagement from 2013, moving up nearly four points from 34.7%. At the other end of the spectrum, employees in manufacturing or production jobs recorded the lowest levels of engagement with an average of 23%. Employees in transportation (25.5%) and service (28.2%) roles also had engagement levels that fell well below the national average. Among the generations, traditionalists are the most engaged group, at 42.2%, possibly because the few who work do so by choice and enjoy their jobs. 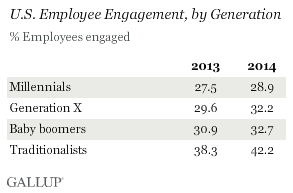 Millennials are the least engaged group, at 28.9%. Although the economy is improving, workers in this generation may not be getting the jobs they had hoped for coming out of college. Gallup's employee engagement data reveal that millennials are particularly less likely than other generations to say they "have the opportunity to do what they do best" at work. This finding suggests that millennials may not be working in jobs that allow them to use their talents and strengths, thus creating disengagement. At 31.5%, employee engagement is at its highest level since Gallup first began measuring the performance indicator in 2000. As Gallup has reported, public perceptions of the economy and job market are increasingly positive following improved GDP growth and lower unemployment. Workers' improved engagement levels could be a reflection of the country's improved economic conditions. Engagement began to drop in 2008 during the financial collapse and continued to fall in 2009, not showing any signs of improvement until 2011, and then reaching its current peak in 2014. Employee engagement initiatives have also become more commonplace since Gallup first introduced its Q12 employee engagement survey in the late 1990s, with nearly 30 million workers being assessed on the instrument along with managerial training. Many organizations increasingly assess their managers on engagement metrics and expect them to maintain employees' engagement levels. Employee engagement levels might be rising to some degree because managers increasingly see engaging employees as a natural part of their duties. Managers are giving engagement more attention than they have in the past, potentially leading to higher engagement percentages. While 31.5% of U.S. employees are engaged, there are organizations that have doubled this number, perhaps most notably the Gallup Great Workplace Award winners. These organizations excel in their employee engagement strategies and they have realized substantial increases in engagement levels as a result. Results for this Gallup poll are based on telephone interviews conducted January to December 2014, on the Gallup U.S. Daily survey, with a random sample of 80,837 adults, aged 18 and older, living in all 50 U.S. states and the District of Columbia. For results based on the total sample of national adults, the margin of sampling error is ±1 percentage points at the 95% confidence level. Age, generation, gender, education level and tenure, among other things, all relate to a worker's engagement. The Gallup Daily tracking survey, which began in 2008, is an unprecedented survey of 1,000 U.S. adults each day, 350 days per year. Gallup Daily tracking consists of two parallel surveys: the U.S. Daily and the Gallup-Healthways Well-Being Index.